Ms. Jeanette Grell-Hull presents blankets to Project Officer for School Libraries on Nevis, Mrs. Marva Roberts, on behalf of Hearts and Hands for Nevis Incorporated. NIA-CHARLESTOWN, NEVIS (October 26TH, 2011) — The Department of Education on Nevis has, in recent years, stood out for its innovative ideas that add excitement and creativity to learning. Following great reviews of the April 14TH Family Book Feud, the School Librarians Association within the Department of Education is ready to execute an exhilarating Blanket Night on Oct. 29TH at the Elquemedo T. Willett Park. The highly anticipated event has attracted the attention of two United States [US]-based Nevisian organisations: Hearts and Hands for Nevis Incorporated and the Nevis Association of South Florida. Their contributions, together with those of local sponsors: Mr. Alton Browne of Browne’s Construction, the Nevis Electricity Company Limited [NEVLEC], Island Mouldings Limited and Kay’s Electrical Services, would set the ambience for an interesting night of family fun. 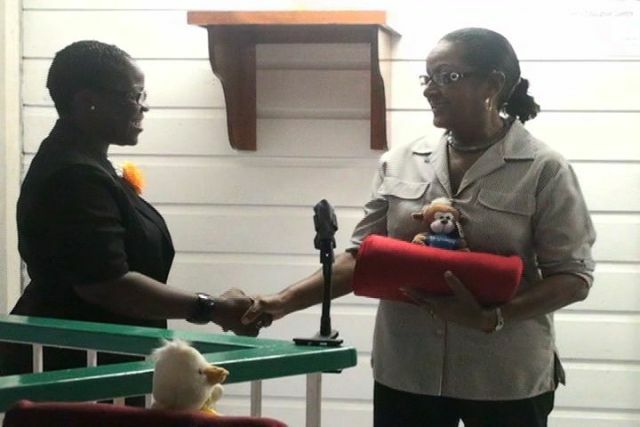 At a recent handing over ceremony, two well-known Nevisians; Ms. Jeanette Grell-Hull and Mrs. Sonita Daniel, presented blankets and teddy bears to the Department of Education on behalf of the US-based organisations. With the donations came an appeal for Nevisian families to capitalise on the initiative taken by the Department of Education. “I hope that the families who attend the function would enjoy what the Education Department has planned for them and use it for the specific purpose that it was done for,” Ms. Grell-Hull said shortly before Mrs. Daniel echoed a similar sentiment. 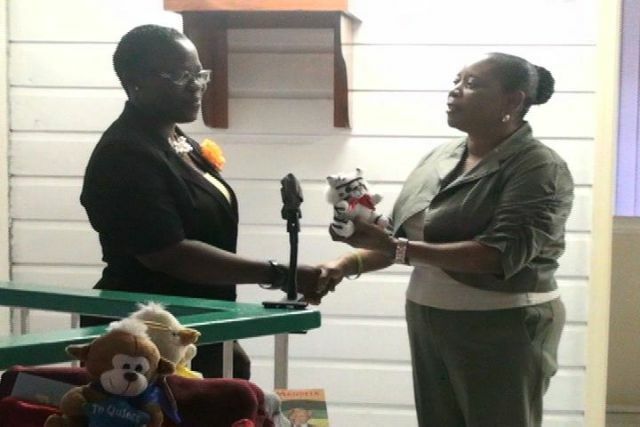 “This association is very pleased again to be partnering with the Nevis Library Service to ensure that our children are provided with a good foundation in reading and that they grow up to be lifelong readers and take their place in the Nevisian society,” Mrs. Daniel said. Describing Blanket Night as the “peek event” for School Librarians’ Month, Project Officer for School Libraries on Nevis Mrs. Marva Roberts, encouraged persons to register their families, at libraries and preschools, for the event. Noting that Blanket Night will cater to “families of the various preschools and primary schools on the island,” Mrs. Roberts recorded appreciation to the sponsors and [she] underpinned the significance of the event. “We are very happy that other associations can partner with us in this drive as we try to heighten the educational levels of our children and also to encourage families in our communities to spend time together, thus strengthening the ties within our families,” Mrs. Parris explained. Also present at the handing over ceremony were Teacher Librarian and President of the School Librarians’ Association Ms. Londa Browne and Librarian at the Charlestown Secondary School and Secretary of the School Librarians’ Association Mrs. Dion Hanley.